NOTES: Multimedia kit with resin and photo-etch details. The T-33 (aka "T-Bird") was developed from the Lockheed P-80/F-80 by lengthening the fuselage by slightly over three feet and adding a second seat, instrumentation and flight controls. It was initially designated as a variant of the P-80/F-80, the TP-80C/TF-80C. Design work for the Lockheed P-80 began in 1943 with the first flight on 8 January 1944. Following on the Bell P-59, the P-80 became the first jet fighter to enter full squadron service in the United States Army Air Forces. As more advanced jets entered service, the F-80 took on another role - training jet pilots. The two-place T-33 jet was designed for training pilots already qualified to fly propeller-driven aircraft. Originally designated the TF-80C, the T-33 made its first flight on 22 March 1948 with US production taking place from 1948 to 1959. The US Navy used the T-33 as a land-based trainer starting in 1949. It was designated the TV-2, but was redesignated the T-33B in 1962. The Navy operated some ex-USAF P-80Cs as the TO-1, changed to the TV-1 about a year later. A carrier-capable version of the P-80/T-33 family was subsequently developed by Lockheed, eventually leading to the late 1950s to 1970s T2V-1/T-1A SeaStar. A total of 6,557 Shooting Stars were produced, 5,691 by Lockheed.Despite its vintage, the venerable T-33 still remains in service worldwide with a few air forces. 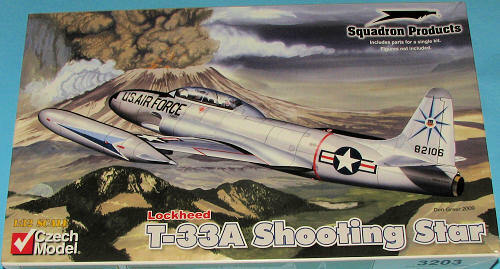 When Czech Model brought out their 1/32 F-80C, it was hoped by many that a T-33 would follow. Now that hope has come to fruition with this release. As the T-33 was based on the F-80, so this Czech Model kit has a basis in their earlier F-80C. Though you'd think that there wouldn't be much difference, Czech Model has taken the wise way to things by actually molding new parts rather than just supplying bits where we would hack off the old parts and install the new ones. I've only shown the new sprues. For the rest of them, visit the F-80C preview. There are new fuselage halves, new cockpit interior with new instrument panels, new canopy, new tip tanks, and new intake sections to name the major bits. The resin parts are pretty much similar to what we had with the F-80C with the addition of the proper seats and new throttles and linkage amongst the new bits. We still have early and later resin wheels as well as a few other small cockpit pieces. The resin is very well done as you'd expect from True Details. 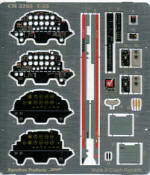 The kit also includes a full color photo etch fret that has front and rear instrument panels with an instrument backing. 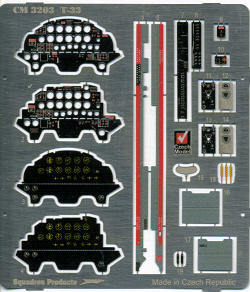 In fact, the plastic panels have instrument shapes on the back, which is a nice touch. Also in the p.e. fret are canopy sills and console bits. I appreciate that Czech Model did not go nuts with the photo etch and provide bits that would be most useful in making the cockpit look good. Those who are not fond of p.e. will be pleased with this set. Things that have not changed are the engine intake trunking assembly, wheel wells, wings and tail planes. 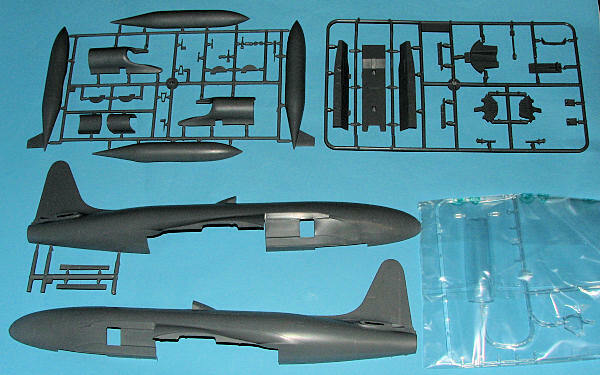 Those who have resin parts for these areas that are designed for the F-80C, should find that they fit the T-33 just fine. I should note that like the F-80C kit, the plastic nose wheel (late) is better molded than the resin one. Actually, I doubt if any of the schemes will use the early wheels, so you can consign those to the parts box. I also noticed that in this kit, Czech Model does not have you install the intake assembly to the wing first. Instead, they have it installed in the fuselage prior to attaching the wing. The instructions are superb. It is a 12 page color booklet that includes the 25 construction steps, three markings diagrams and data placement sheet. The construction steps are not only quite clear and easy to understand, but if there is a precise order of assembly, that is pointed out. I'm pleased to see that the error on the proper installation of the nose gear has been corrected. Any color requirements are clearly shown in the construction process. Markings are provided for three planes. One is the box art plane from the 318 FIS in Washington state in overall ADC Grey. A second option is for a Luftwaffe T-33 in RAL 6003/7037 over 7015 with da-glo orange outer tanks. Approximate FS 595 options are provided. Finally, a Belgian AF T-33 from 1969 in the standard four color SEA camouflage scheme. The huge decal sheet (which is larger than the platen on my scanner) is superbly printed by Cartograf so you know it is the best quality. I'm really quite jazzed with this latest release from Czech Model and you can be sure that this one is on the top of the 'to do' pile. 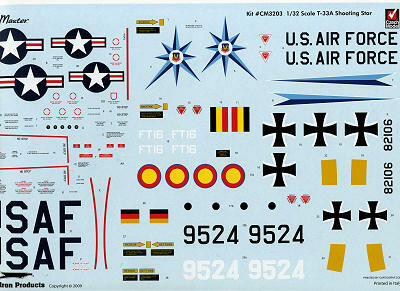 I know that aftermarket will be available in the near future, including a number of new decal sheets. About the only thing I would have liked to have seen added would have been the nose guns as T-33s were often armed as AT-33s, but I this will probably be coming later in a resin upgrade set. Right now, if you like the T-bird, this is one you MUST have. Thanks to Squadron Products for the review kit. Get yours today at your local shop or on-line retailer.